It's that time of the year again when we celebrate a blog anniversary and some serious Vegan food. Oh yes, this blog turned SEVEN years and also it's time for VeganMoFo 2014. Woohoo! Last year, a few days into the game, things on the personal front got awry and I had to abandon the challenge mid way. This year, am determined to see it through the end. The goal is simple: to cook and publish a vegan recipe every single weekday of September 2014. I did the math and that will come up to 21 new recipes. 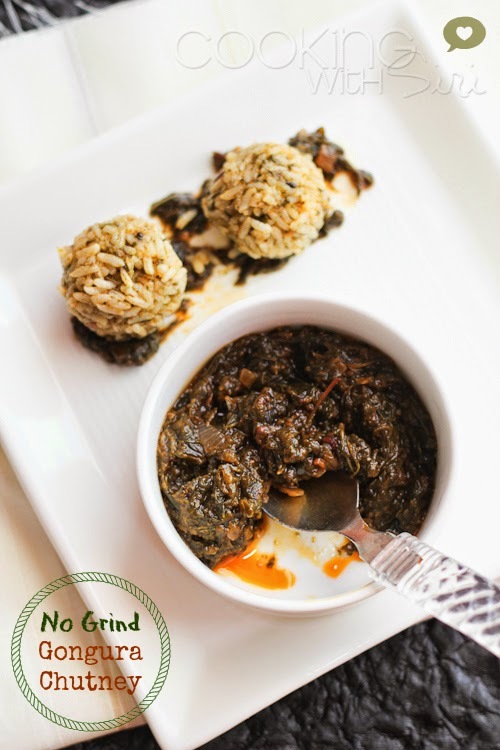 :-) Wish me luck folks and here I am with the first recipe for the vegan challenge - an easy-peasy No Grind Gongura Pachadi i.e Chutney with Sorrel Leaves, a favorite in my household and devoured every single time my mother makes it. On August 26th 2014, which was a few days ago this blog of mine completed its 7th year of existence. It feels like just yesterday I wrote my feelings on finishing a 6 years marathon. Someone who is known for ruthlessly trying and abandoning hobbies in the past, that is quite an accomplishment in itself. I have penned down the reasons why I love to blog in this post. Every single reason listed over there still hold true and can't express in words how fortunate I am to be a part of such vibrant & helpful blogging community. Thank you all for your constant support and encouragement. And also a special mention to those journos and big foodie websites who thought my recipes were worth a mention. This year, especially saw a surge in media mentions which has been personally such a big boost - to cook, photograph and write more! Thank You. Cheers to much more cooking, many more friendships and delicious times ahead! Notes: Dry roast about 2 tbsp cumin seeds and 1 tbsp o fenugreek (methi) seeds separately. Cool and grind them together. Store in an air tight container. This powder can be used in this under 15 minute Andhra style Buttermilk (Menthi Majjiga/Mor Kuzhambu) or use a dash in this chutney. Pluck the leaves and remove stalks from the bunches of gongura. Wash and chop finely. Set aside. Heat oil in a wide mouthed kadai and add onions. Cook for a minute and then drop crushed garlic, turmeric, salt, red chilli powder, cumin-methi powder and tamarind pulp. On medium heat, cook the spices for 1 minute. Next goes in chopped gongura leaves. Reduce the heat to low and let it cook for 10 minutes, mixing once or twice while it is cooking. Take a pestle (heavy club-shaped object in the mortar & pestle) or a potato masher and lightly mash the entire gongura mixture. Stir occasionally and on a low heat cook the chutney for 10 more minutes, until the raw smell from the leaves is gone. Cool and store in a tight container. Serve some with hot rice and melted ghee on the top. At room temperature, this chutney will be good for a week and when refrigerated, it will stay put up to a month. Congratulations Siri and wishing you and the beautiful, delicious blog many many more happy years. Love this chutney too. Congratulations on your 7 year blog anniversary and all that you have accomplished so far. This chutney sounds so flavorful! Happy 7th Anniversary! I'm so glad to find your blog. I love Indian food. Your recipes and photos look amazing! Your pictures are beautiful. Your 7 years of practice really shows.